A blend of high quality 100% Whey Proteins: WPC and WPI, to increase muscle performance and improve post-workout recovery aches and pains. As a dietary supplement, add 1 scoop to 6 fl oz cold water or 2 scoops to 12 fl oz of cold water. Consume 1-2 servings daily. For best results, use as part of a proper diet exercise program. Whey Protein Isolate, Whey Protein Concentrate, Natural & Artificial Flavors, Guar Gum, Acesulfame Potassium, Sucralose. 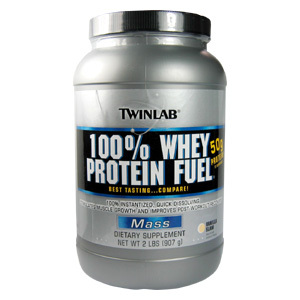 Stimulates muscle protein anabolism, which enhances muscle building and lean tissue mass. With this ability, you will be able to maximize your muscle growth that occurs after exercising. In addition, this superior formula can increase muscle performance and improve post-workout recovery by reducing aches and pains. 100% Whey Protein Fuel Vanilla 2 LB - is shipped in a discrete, unmarked package. Orders are processed immediately and usually take about 3 to 5 working days to be received. We do ask that you try it for 2 to 3 weeks to feel the full effects. Any information received is used only for order processing and shipping purposes. Your information, such as e-mail address, will never be disclosed to a third party.